As part of my New Years Resolution, I have decided to add juiced fruits and veggies into my diet. 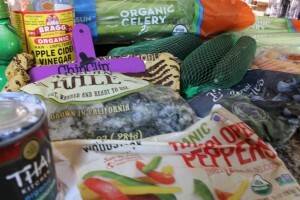 I realize that my decision to use a mix of frozen organic vegetables in place of all fresh vegetables might not be an optimum choice for everyone, but I personally prefer to use the frozen organics over fresh non-organics. I also blanched the kale. I cook any cruciferous or green leafy vegetables, because these contain goitrogens that are not great for the thyroid. Cooking helps eliminate most of these compounds. You can still juice cooked vegetables, just put them in the juicer with a few stalks of raw celery. Also, although the juicer is easy to use, I know that adding anything extra to my morning routine realistically just isn’t going to happen. If I want to have juice to drink on my workweek mornings, they are going to need to be pre-made. I decided that since I was already juicing this weekend, I had all of my fresh veggies cleaned and ready to go and the juicer was already full of pulp I may as well just keep juicing. I put the juice into small freezable containers (add a little space for the juice to grow as it freezes) and into the freezer they went. I will just transfer one to the refrigerator each night to thaw for the next morning. Done! Once again, this might not be the “ideal” juicing practice to some. For me though, frozen vegetable juice is better than no juice at all. 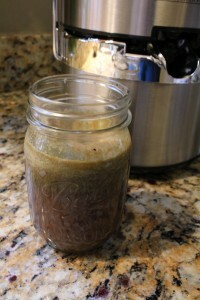 I saved all of the pulp from this batch of juice as well, and plan to use that to make a great pureed vegetable soup. 1. Make sure to push down on the spout to open it before you start juicing, or your juicer will overflow. That was a fun surprise! Also make sure to keep the opening clear when juicing things like blueberries so it doesn’t clog and overflow. 2. Be careful when cleaning the blade and strainer basket- they are very sharp. The brush included with the machine does make these easy to clean though. 3. 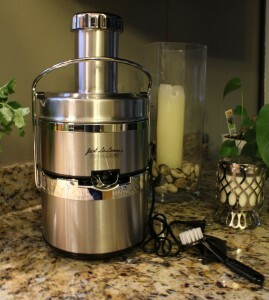 Clean everything immediately after juicing, or the dried pulp will be much more difficult to remove. That is about it! Overall this machine was much easier to use, clean, and reassemble than I expected it to be. The juice was smooth and very delicious. Highly recommended! Wash all vegetables thoroughly, using organic ingredients whenever possible. Place mushrooms into a food processor and chop to the consistency of a ground “meat” substitute. Add eggs, salt and pepper to the processor and mix well. Sauté the red peppers, green peppers and onions to remove some of their moisture if desired and combine with the egg/mushroom mixture. 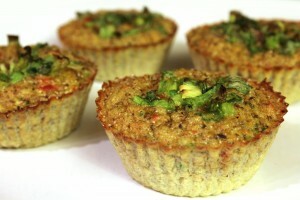 Pour into muffin tins (silicone muffin tins work very well for this purpose) and use chopped green onions as a garnish. Just in time for the weekend mornings ahead! This is one of our family favorites, and I figured out a way to make it gluten free, easy and relatively healthy! Enjoy! Place all dry ingredients into mixing bowl and add in water slowly while stirring. Shape mixture into 3″ round patties 3/4″ high. 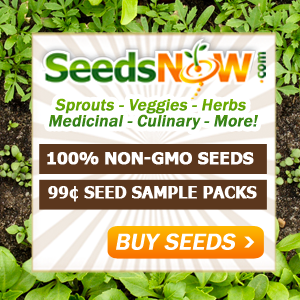 Coat a non-stick skillet or griddle with safflower oil. 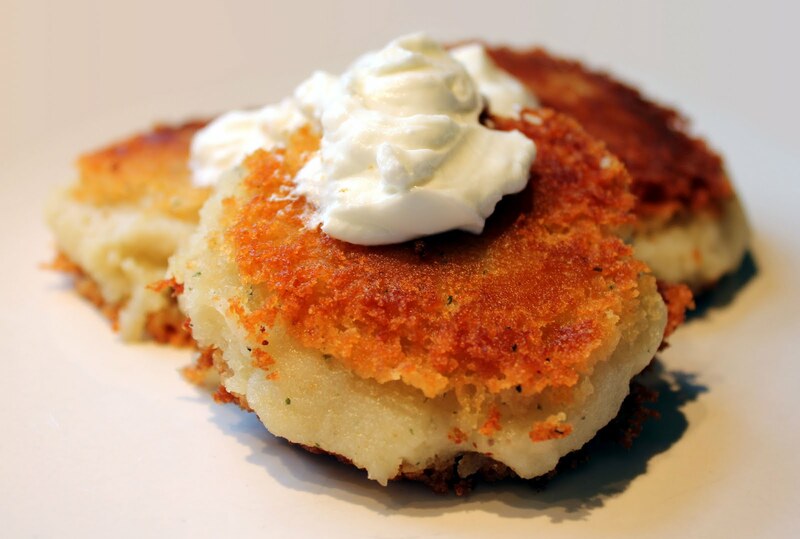 Place patties in oil and cook until golden brown on each side. Top with plain greek yogurt and serve.